I love washi tape. In fact I have a growing collection of beautiful washi tape - and that's the problem ... it's a collection! I love it, I buy it and then I don't use it and joins my collection! So I'm trying to turn over a new leaf and use my latest addition to the collection - the very gorgeous Year of Cheer Specialty Washi tape. I didn't really have a plan in mind, I just started adding strips of washi to a piece of Basic Gray cardstock. 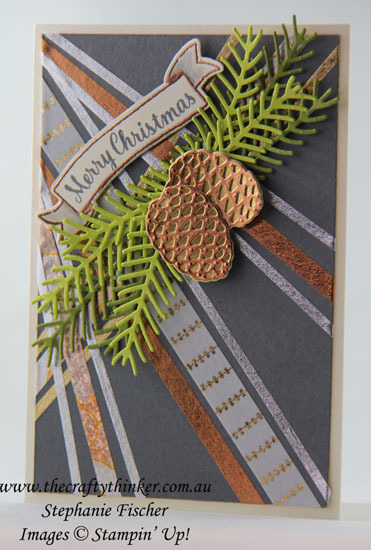 I then used the Pretty Pines dies to cut some pine branches in Old Olive and Lemon Lime Twist cardstock and the pine cones are layers of gold and copper foil sheet. 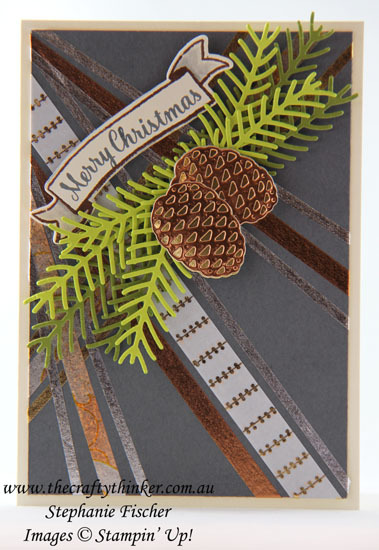 I copper heat embossed the banner from the Banners For You stamp set and stamped the greeting from the Star of Light stamp set in Basic Gray. One of the great thing about photopolymer greetings is that you can manipulate them to fit the shape of the banner. I watercoloured a little Basic Gray to the ends of the banners and cut it out with one of the Bunch of Banners framelits. I adhered the grey panel to a Very Vanilla card base (I used the thick Very Vanilla cardstock) to finish this quick, simple but elegant Christmas card.